At 25, Sean Murray has experienced his fair share of of highs and lows in his professional career. As a teenager, he made his full debut for Watford in the FA Cup against a Spurs team with the likes of Luka Modric in its ranks. 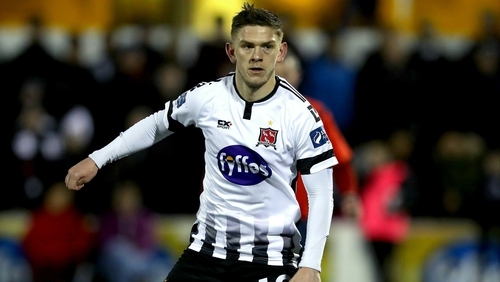 Fast forward six years and he has signed a deal with Dundalk after ending his contract with Danish Superliga outfit Vejle Boldklub. It's been a journey but one that Murray hopes has taken a positive turn with his move to the Airtricity League champions. "I want to start enjoying my football again and I want to win trophies," Murray told RTÉ Sport. "I want to get that good feeling back again because over the last six months in Denmark it wasn’t really like that. "I think when you are at a place where you enjoy playing football and enjoying it in a good atmosphere it will be a help and bring back the enjoyment." "When I was young, 17 or 18, I was playing a lot, it was good. There are going to be times when you drop and you aren’t getting into the team, but you just have to get through those difficult times, and try be happy playing." Murray was a product of the Watford Academy, joining the club when he was nine. He made almost 100 appearances for the Hornets in the Championship. A change of ownership at the club led to a loan spell at Wigan Athletic before moves to Swindon Town and Colchester United, where he made 56 appearances across a season. Despite his career with Watford not going to plan, he still likes to see them doing well in the Premier league. "I’m happy for them. I was there when I was a kid until I was 22, it’s my local team, I’d always be happy for them, they gave me my start to my career, even though it didn't end the way I wanted it to. "I was injured for the last part of it and had to leave I’m always happy to see them have success." Before his transfer to Dundalk became official, Murray spent a week training with the club and played against Drogheda in the Jim Malone Cup. At the end of Murray's trial, Dundalk Head Coach Vinny Perth said he'd never seen a player fit in so well in team after a week. "It felt very comfortable for me to come in, it's normally difficult to go to a team and be on trial but I think the decision for me after coming in for the week was that I just wanted to get it done as quickly as possible but the clubs had to sort out stuff." The club was impressed with Murray but he was equally impressed with them. He was aware of their success but wasn't familiar with the standard of the league and it's players. "I didn’t think it would be as professional as it is, the players put in so much effort into training. "I like being professional myself so to come into a club like that has been great. The players' levels of professionalism and the clubs would be very similar to any club I've played with in England." Not only did Dundlak win the League, they did the double, beating Cork City in the Cup final at the Aviva Stadium. With this success comes massive competition for places. "It’s going to be very hard after the boys in the team have won the League and the Cup, they have played in Europe. "It’s not going to be easy to get a place in the team. I’m going to have to work hard, I’ve had that in my mind since I came over that I will have to work double hard to get into the team. "Even me coming in will make the guys in the team work harder and play better because I’ll be behind them trying to take their place on the team so they will have to work harder and play better. So it will be good for everyone." Murray has represented the Republic of Ireland right up through the underage ranks as far as under 21 level. Getting a senior cap is something that he feels could be achievable now that he's closer to home. "It’s all down to me, as long as I show on the pitch that I’m up to that level. It’s definitely an added bonus, coming over here. "If I was playing in Denmark, I don’t think I’d have as much chance as they wouldn’t be looking at the Danish League but being here right under their noses is good. "I want to do well this season on a personal level it’s going to be down to me." Murray will get his season underway on Saturday when Dundalk play Cork City in the Presidents Cup. He's got a point to prove and can't wait to get started. "It’s the first chance to win a trophy and everyone will be up for it no matter if they are your rivals or not, they will want to win silverware."